Do I need Orthodontic Treatment Now or Later? 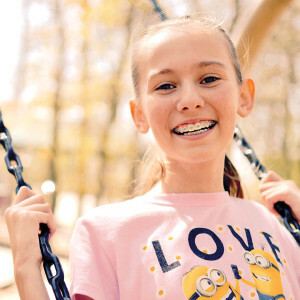 If you’re reading this, you’re likely interested for yourself, or you have a young person in your home and you’re wondering if it’s a good time to seek orthodontic treatment. This blog post will walk you through the steps of when and why. If you are an adult and are wondering when a good time is to seek treatment for your misaligned teeth, why not do it now? About half of my orthodontic patients are adults. And that includes my wife (Sorry honey!). It can make a huge difference in your smile-outlook-ometer, which is a measuring device that I just made up. In all seriousness, straighter teeth will make a difference. In adults, gum disease is prevalent in about half of adults aged 30 and older. Gum disease is essentially infected gums from a bacterial invasion, and can be easily treated with a little more involved dental cleaning. And, with the help of my alma mater (Boston University), and now many other facilities around the globe since then, gum disease has been directly linked with heart disease. Misaligned teeth can actually increase the prevalence of gum disease in adults, because it is so much harder to floss and brush those tough to reach areas. And when gum disease happens, it can cause those bacteria to infiltrate the rest of our body and cause build up to happen, making our overall health worse. So coming back around, straighter teeth has been proven to help your heart health, whether it be a healthier heart or a happier heart because your teeth are straight. Now, if you have a kiddo and you’re wondering when to get them checked out, you’re in luck. I have the answer for you. Do it now! There are so many small, interceptive things that can be done to help stop any problems that may happen over time, such as impacted teeth, growth issues, bite issues and the list goes on. Once a child reaches around 8 years old, we really start to look and see where potential issues may happen. Most of the time, nothing is done but a 6 month or yearly recall, but sometimes, we may utilize a small appliance or even limited brackets to get a tooth or teeth into a better position to allow another one to move into it’s correct home. With digital radiography and digital impression technology, it has never been easier to get an accurate diagnosis earlier in life so that you can plan with the dentist. When it comes to orthodontics, there are several options as well. Of course, there are the traditional metal brackets, but now there are ceramic brackets, or “cosmetic brackets” that are catching on in popularity. Also, Invisalign is a great option, and in recent years has come a long way with the addition of Invisalign Teen and Invisalign Express. They’re all fantastic options, and should you be interested in any of them, a consultation is highly recommended to choose which orthodontic treatment is best. All in all, straighter teeth can help you get a healthier smile and have a happier outlook on life! Call or get in touch today for a complimentary consultation and see if you or your loved ones would like to explore the possibility of orthodontic treatment!